The Liebers: We Have SEVEN New Family Members at our House! We Have SEVEN New Family Members at our House! 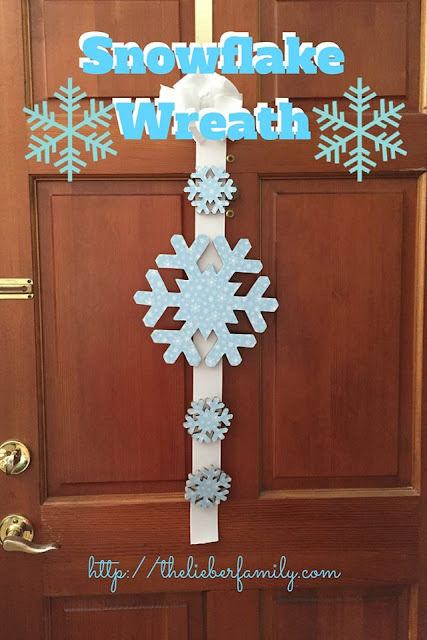 Shortly after Benjamin (our third child) was born, I wrote a post entitled Four? Four!! It was a post about Henry's fourth birthday. The boys' birthdays are only about seven weeks apart. When I shared the post on Facebook, someone mistakenly thought I was announcing my 4th pregnancy. Then I had a lot of fires to put out!! With this post title, I hope that I have not mistakenly led anyone to believe that I am pregnant...with septuplets. Because...NO! Thank you, but no. I do not plan on having septuplets. And as far as I know, septuplets take some planning. I don't think they even occur naturally. Right?! Great! Now I'm paranoid!! I'm really just wanting to share our new fish with you. That's right...FISH! Seven of them. 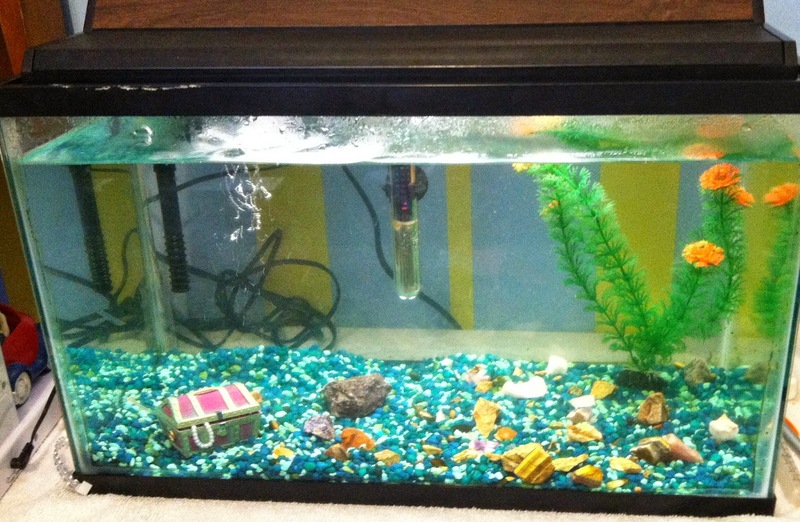 The kids got a tank for Christmas and we set it up shortly thereafter. I've Googled aquarium care and one of the things I learned was that you can stress out your tank if you add too many things at one time. 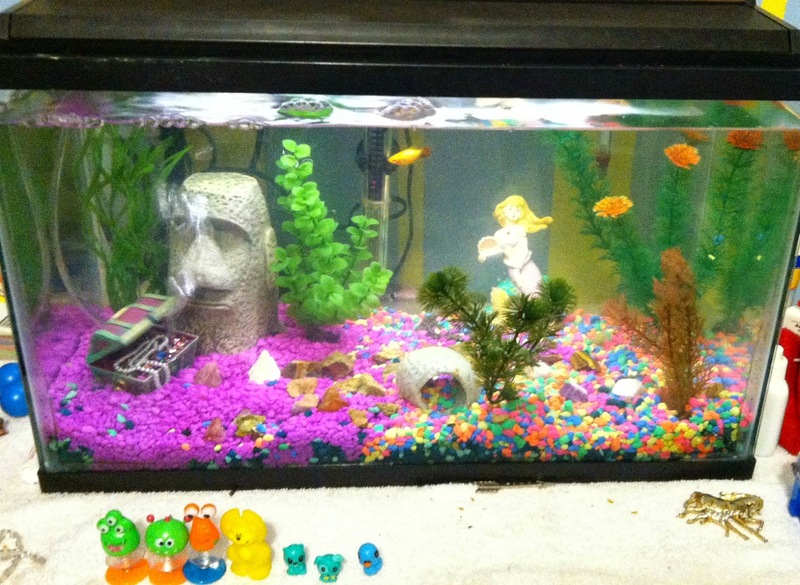 With that in mind, we've added fish two at a time until we got to our tank max of seven. The last three were added on Saturday and now our fish tank home is complete. The first two fish were chosen by Frances. She won that right in a Solomon's Choice-type decision. I asked each kid to tell me who should choose first and why. The boys each picked themselves, but Frances picked Benjamin (for a somewhat legitimate reason), so I told her she got to pick first for being unselfish. The boys only cried for a minute and then the fun of picking out fish calmed them down. Frances chose two Mickey Mouse platys. It's not obvious to everyone at first glance, but these fish have a distinct Mickey Mouse head shape on their tails. They are mostly orange fish, aside from that marking. 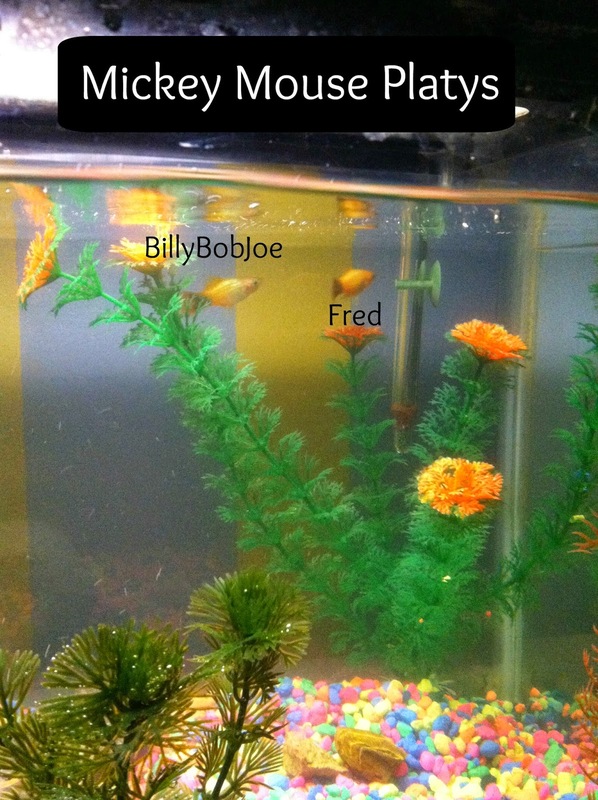 She named her fish BillyBobJoe and Fred. (Don't ask me why...) BillyBobJoe is slightly bigger and has a lighter belly than Fred. The next week, it was Henry's turn. He chose to red eyed tetras. They got this name from the red rings around their eyes. 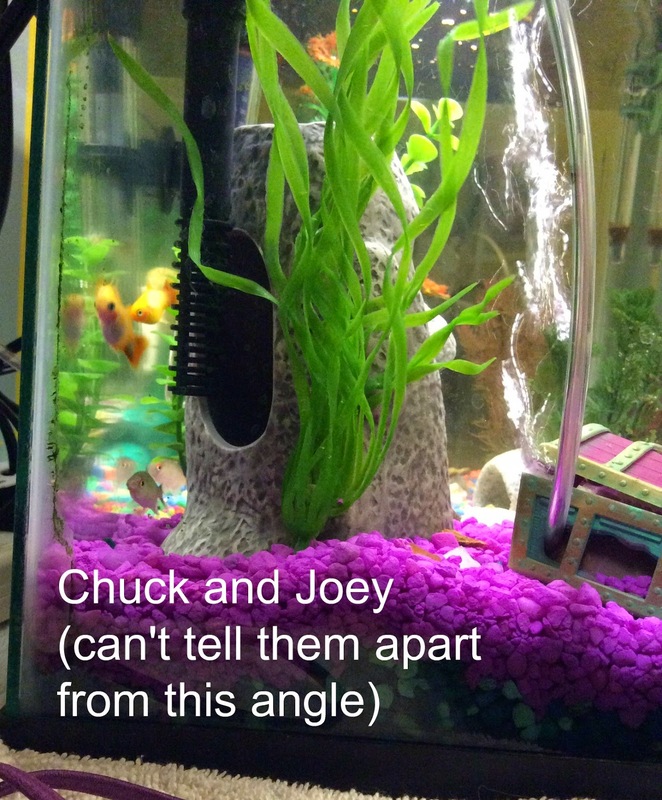 Henry named his fish Chuck and Joey. I was worried about Chuck the first night because he wasn't swimming very much. I was prepared to have "the talk" with Henry, but then the fish seemed to recover and dart around the tank. Since then, I've noticed that must be his normal behavior. Chuck looks like he's been in a few fights as his lip was cut and his tail has a split in it. The past Saturday Benjamin finally got his turn to pick fish. He actually told me he didn't want Frances and Henry to come with him, so we set off on a fish finding date together. He had a good time looking at all the choices and since we were alone I had the ability to tell him about each kind. I steered him towards some pretty blue fish so we could add some color to the tank. They turned out to be fancy guppies. Not just plain guppies, guys. FANCY guppies! And if you're wondering...Yes, we did sing (just the refrain of) "Fancy" to them (until Ken told us to stop!) 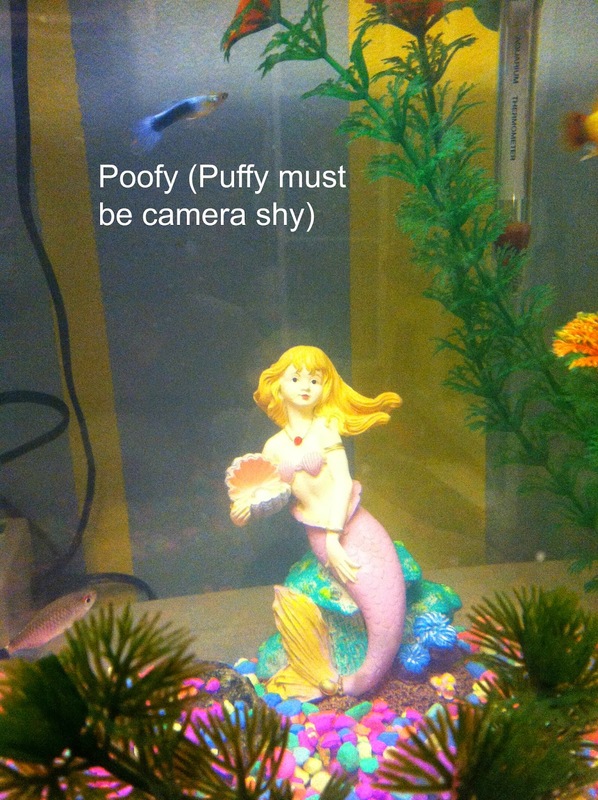 Benjamin named his fish Poofy and Puffy. Poofy has a pink spot on his tail so we can tell them apart. And the seventh fish? He's mine! I picked out a Chinese algae eater (not such a fancy name, huh?). He's tiny, and he won't likely grow much bigger. His name is Harold. I don't really know why, but it seemed to fit in with all the other wacky names. Now we have a full tank in our full house. The kids love watching the fish swim around and have gotten into a good pattern to take turns feeding them. I'll admit to going in there on occasion just to watch them swim around and to try and find all of them. And I shouldn't mention it, but I've found Ken in there a few times, reading a book and just checking on them. A.F. (After Fish) The kids like to give them different toys to look at. Do you have pets? How did you come up with their names? I love it! Such creative names! 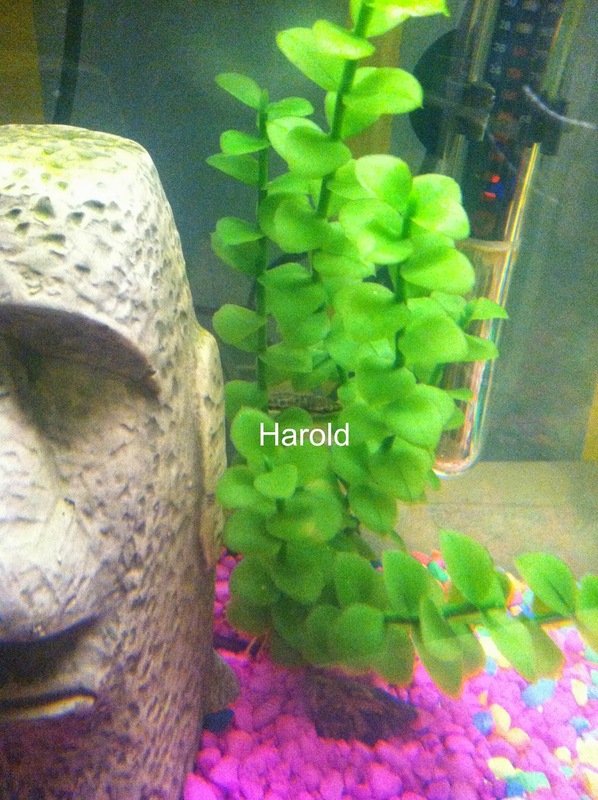 I think Harold is my favorite though! Their names are hilarious! I would have a hard time though telling them apart and call them the wrong name. Although I can actually tell my children apart and still call them the wrong names. Oh well, enjoy your new family members! Love the tank. My daughter would love a fish. Our cat would probably try to eat them. Aw.. Harold. Love the mermaid! My brother-in-law is a big time aquarium hobbyist. He has one that takes up a whole room, although I may be exaggerating that. It takes up a whole wall, though. I love the enthusiasm of this post and their "first" names. That was so me five-ish years ago. Now I am so tired of our tank. We used to have names for them and we did down to when the last original one died. I can remember we had a Sunshine and Rain. One of our Mickey Mouse Platy's was named Montice. My son was five at the time and just made that name up. Montice died and we bought another that lasted for years and his name was "Montice's brother". We had a white Molly named "Molly", a black Molly named Night. LOL. We have about five fish and some babies now and none have a name. We have a goldfish named Stripe (Lily's) and a female betta named Lacy (Emmy's). They each have their own tank--spoiled fish! So cool that y'all are loving your aquarium (even Ken!!!). Love all the names of the fish!! It's very calming even just to look at fishes. I guess that's probably why people put an aquarium in their homes too. So happy you all got to choose your own fish! I keep meaning to get the boys some fish! We have everything but the fish! It is so peaceful and I KNOW they would love it! Congrats on the new arrivals! I can tell them apart when they are near each other. I just hope they don't grow too much. I have two boys and I just call them both "bubby." It's easier on me. LOL! I'm cool with adding more fish to the family, but more kids would take a HUGE adjustment!! Ours has a lid the cat can't get to. Plus our cat is not a good jumper. Cats getting into the tank is a real danger I've heard of, though! We had a much bigger tank growing up. I never realized how much I'd missed it until we got this set up. If we had more room, I'd love to get a bigger tank! Benjamin wanted to name his fish "fishy" and "fish head" I helped him reconsider! I'm worried about fish dying because I don't want to have that discussion with the kids, but I know it's going to happen at some point. Oooh! Fancy! Our fishies seem okay with sharing the tank so far. I saw two different ones swimming together today, so that made me happy! It's so soothing to watch! The kids had fun naming them, even if the names are weird (for fish). I had a friend who had two in-wall aquariums in his living room! That was awesome!! They would love it! And they are easy to take care of. Certainly easier than our old, annoying cat!! I love looking at fish tanks, especially the big ones, but I just don't have the energy to take care of one. We have the four legged variety of pets...2 dogs and a cat. We have an black weenie dog with little gray streaks in her fur, named Pepper, and an all black cat, named Shadow, and a giant German Shepherd named Caellum. :) Have a great week, Rabia! How do you feel about the movie "Finding Nemo"?? LOL! !